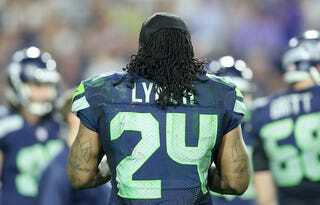 Lynch will get $1 million in base salary, $1 million as a roster bonus, and $9 million for a signing bonus. Seattle avoids a long-term commitment, and for now, Lynch earns the second-most money for a running back in 2015 (Adrian Peterson's first). Update (6:50 p.m.): So, Clayton's details might have been wrong. ESPN has already deleted that portion from their article. Also, Mike Florio reports that Lynch's deal is for three years, with $12 million this season, split into a $4.5 million guaranteed base salary and a signing bonus of $7.5 million. In 2016, Lynch (if he plays) will get a base salary of $9 million. In 2017 (if he plays), it's a base salary of $7 million in 2017 along with a $3 million roster bonus due on the fifth day of the 2017 league year. Update (8:27 p.m.): Ian Rapoport says the deal's actually two years, $24 million.